Cable ticked higher on Monday but remains directionless and in range trading that extends into sixth straight day. 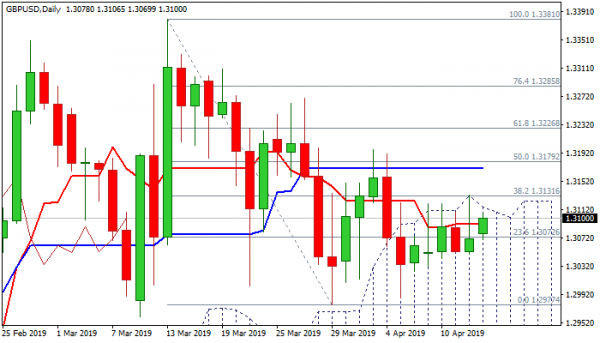 Near-term action remains capped by daily cloud top (1.3115) which marks key resistance along with Fibo barrier at 1.3131 (38.2% of 1.3381/1.2977). Flat daily indicators add to neutral mode, but absence of news from Brexit is the main obstacle. Releases of Key UK data are in focus this week with jobs/earnings data are due tomorrow, inflation on Wednesday and retail sales on Thursday. Data could generate fresh direction signals in holiday-shortened week with lower volumes. Sustained break above cloud top / Fibo barrier would generate bullish signal for recovery extension towards targets at 1.3179/96 (50% retracement / 3 Apr high), while close below 1.3030/40 zone (base of recent range) would weaken near-term structure and expose key support at 1.2974 (200SMA).